Until a couple of years ago, a few multinational companies were selling hi-tech sugar harvesting machines in India for over Rs1 crore. While the machines were a big relief for the labour shortage plagued sugarcane grower community, affordability was an issue. Also, the hi-tech machines did not suit the requirements of Indian farmers. After sales service too was a problem. That was when Rajkot-based farm machinery maker Tirth Agro Technology came out with an Indianised, less tech-intensive and rugged version of sugarcane harvesters. The machine was priced at about Rs85 lakh. Soon the company was able to kill the monopoly of multinationals in the market. So far, the company has sold over 200 such machines across India. Indeed, Tirth Agro sells many variants of mechanised farm equipment across the crop cycle from seed preparation, sowing and planting, crop management to harvesting and crop residue management under its brand name, 'Shaktiman'. It is the winner of Business Todays 'Best SME award' in the agriculture and allied sector. "Very often farmers are only comfortable with rugged machines that suit Indian conditions. So, first we develop a machine and then extensively sell the concept to farmers through demonstrations. That is how we create a market for our machines", says Ashwin Gohil, Chairman of Tirth Agro Technology, set up in 1997 by late Ladhubhai Gohil, a farmer from Halvad in Surendranagar district of Gujarat. From trading of farm implements, the 100 per cent Gohil family-owned Tirth Agro progressed to become an organised manufacturer of tractor drawn and self propelled farm machinery. With 650 dealers and 50 distributors across India, it has a good share of the organised agricultural machinery market. The company's products are exported to 60 countries and its claims to be the largest rotary tiller manufacturer in the world. Tirth Agro invests 5 per cent of its revenues every year in R&D, says the chairman. It introduces three-four new products every year. Farmers are brought to the factory premises to test the machines at a 100-acre farm owned by the Gohils. 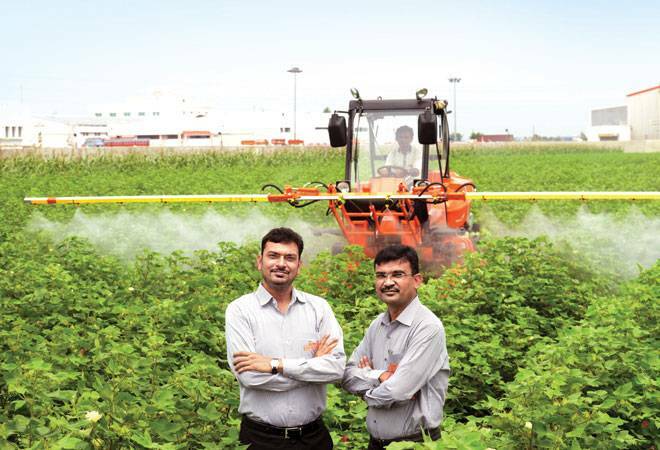 "Our manufacturing facility is spread over 60,000 square feet and has the capacity to produce 125,000 tillers a year," says Ashwin Gohil, who is supported by his brother and Managing Director Hasmukh Gohil. In 2015/16, the unlisted company has disclosed that it has posted a turnover of Rs561.7 crore and Profit After tax (PAT) of Rs24.9 crore. Aswin Gohil says the company will more or less mirror its performance last fiscal -- expanding revenues at over 10 per cent -- in 2016/17 as Tamil Nadu, one of its major markets has been facing severe drought, though it has done good business in Maharashtra and Madhya Pradesh. The company hopes to grow over 20 per cent next year if the government's plans to promote agriculture with new schemes take shape by then. Agriculture mechanisation in India is just 2 per cent of the area, compared to 30 per cent in the developed world. So, farm machinery has not developed as a large scale industry in India and is not more than a Rs4,000 crore sector, but is growing at 10-15 per cent annually, says Ashwin Gohil. Brijen Sampat, Advisor to Tirth Agro, notes that mechanisation is the only option for India as availability of labour for working in open fields is coming down every year. "Affordability is an issue for farmers, though government subsidies and initiatives of farmer co-operatives help to promote mechanisation of agriculture. Investments of Rs1 lakh plus in a rotary tiller can be recovered within three years with improved productivity," says Sampat. Ashwin Gohil asserts that that the business has huge potential. About 6.5 lakh tractors are sold in India every year but only 1.5 lakh of them are fitted with agricultural machinery. Similarly, the company's products are getting acceptability in emerging markets. While exports currently constitute only about 20 per cent, the share is rising every year. "We have created capacities that can generate over Rs2,000 crore of revenue a year and hope to achieve that in the coming 4-5 years", says Gohil.